How to Factory Reset through menu on LG E615(LGE615) aka LG Optimus L5 Dual ? 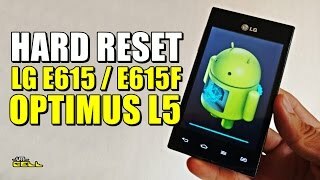 How to Hard Reset on LG E615(LGE615) aka LG Optimus L5 Dual ? Press and hold Volume Down key and Power button for ten seconds. The process starts when the LED in then corner flashed. Release Power key and Volume Down key and press Home button for few second.